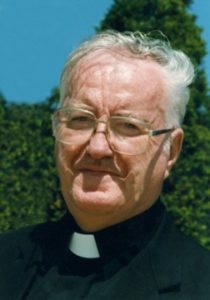 Fr PJ McGlinchey was born on 6 June 1928 in the village of Raphoe and grew up in the town of Letterkenny in County Donegal. 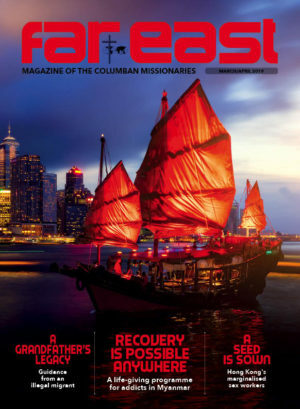 In 1945, he joined the Missionary Society of St Columban and was ordained in 1951, and was assigned to the South Korean diocese of Kwangju in June 1952. Except for his first year on the mainland attending language studies, he has spent “all of my working life” on the island of Jeju, an island up to 70 miles off the southern coast of South Korea, arriving here in 1953, just as the Korean War was ending. With a perimeter of 120 miles, Jeju is by far the largest island in South Korea. At the centre is Mt Halla, an extinct volcano, whose slopes, rising to 6,349 feet, are covered with rocks, forest and scrubby grass. The soil is red lava, porous, with an inability to retain water. 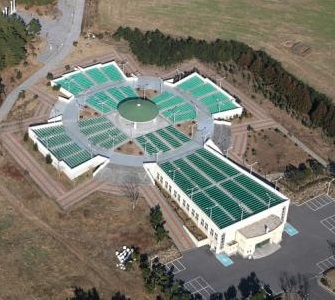 Therefore, although the island has moderate to heavy rainfall, the centre of Jeju lacks a natural permanent water supply. The island and its people were the poorest in South Korea. Hall of the fallen, photos, names and date of death. Some 60,000 people on the island were killed as the result of communist guerrilla activity during the years 1947-1949 and the population was huddled around the seacoast in small farms averaging one-third of a hectare. The society Fr McGlinchey encountered was mired in poverty, trying to eke out an existence by working the fields with wooden ploughs and oxen. With the end of the war, Fr McGlinchey found himself acting as dispenser of the food and clothing provided by Catholic Relief Services. He soon became convinced that continued relief was not the answer; it was better for the people to become independent. Concerned that their farming methods were primitive, he realised that something had to be done for the farmers since preaching would not feed them. Although planting two crops per year, they lived at subsistence level. They were heavily in debt to moneylenders and despair, leading to suicide was not unheard of. Yet 50,000 hectares of land stood idle in the centre of the island. Knowledge gleaned from his father, Patrick, who was a vet, and whom he often heard advising farmers in his home locality in Co Donegal, was soon put to good use as he set about helping to thousands of Jeju’s citizens exit poverty. His model of development and profitable farming encouraged the use of underused farm land and new farming methods. St Isidore farm cultivated pigs, sheep, cows and more recently a stud. A textile factory, employed up to 1,700 Jeju women in a time when jobs on the island were scarce. He also set up a credit union which changed the economy of the island and helped the citizens break free from their poverty. Beginning his ministry in the small town of Hallim on the west coast, Fr PJ’s parish, had a population of 40,000, but only 25 Catholics. Despite his small flock one of his first acts was to build a stone church. 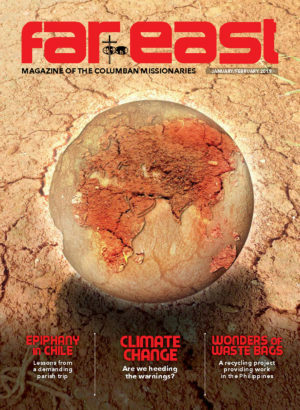 Thanks to the efforts of Fr McGlinchey and other Columban missionaries who came later, there are now 4,500 Catholics and the parish has been divided into two. His first project was a 4-H Club, to promote modern farm methods and good citizenship for 25 of the youngsters of the parish. With his own money, he imported a few good piglets and chickens, held classes to teach the children how to care for them and gave them to the children to raise and breed. With an eye toward influencing young adults who were marrying and in need of farms of their own, McGlinchey walked across the central wastelands to determine how new land might be utilised. As an Irish countryman, he thought of sheep, although the grass was poor and short-lived. Before importing sheep, he decided to set up a cottage industry using the wool from sheep already on the island so there would be an established market for fleece from the sheep farms he envisioned. However, neither he nor the women he tried to teach knew enough about wool preparation and knitting to produce marketable wear. When he returned home on leave in 1960-61 he managed to get some Irish Columban Sisters assigned to Jeju who understood weaving, knitting and design, but in the meantime, he went ahead with his plan of introducing an improved breed of sheep. Recognising now the need for both expertise and capital, neither of which was available in Korea, Fr McGlinchey sought funds from abroad through MISEREOR, OXFAM UK, OXFAM Ireland and OXFAM Canada. He also received funds from his own family. The first priority was the weaving project which began in earnest with the arrival of the Columban Sisters in 1962. A wool processing and weaving factory was set up in quonset huts obtained from the US Air Force Radar Station at Mosulpo on Jeju Island, and with used machinery purchased with funds obtained from MISEREOR. This central factory — where the wool is cleaned, spun, dyed and woven into bolts of tweed — today has over 40 permanent workers. Knitting is done in 300 island households by farmers’ wives and daughters. Converting the idle lands of central Jeju into fertile farms and pastures was another matter. Starting with the purchase of two-thirds of a hectare in 1959, Fr McGlinchey eventually bought 1,000 hectares of undeveloped land. The original land is the site of the training farm of the Isidore Development Association (IDA). When the IDA was formally organised in 1963, with the Archbishop as president and three Koreans on the Board of Directors, Fr McGlinchey was relieved of his pastoral duties to give his full time to its development. Today there are four elements of IDA: the Hallim Weaving Centre, the Central Training Farm, the Hallim Clinic and the Idle Lands Development Project. In recent years, the national government has turned its attention to agriculture, after neglecting it for some time in favour of industry, and is using many of the ideas pioneered on Cheju. It is actively supporting the 4-H movement and 70,000 clubs have been formed throughout the country with the government’s blessing. However, they are just an “empty shell,” Fr PJ warns, unless actively supported by someone of local authority. The New Zealand grass, first grown on the IDA central farm, is now being grown under government auspices elsewhere in Korea, and the government is importing sheep and cattle and giving livestock loans to farmers through government cooperatives. It is buying idle land and redistributing it to farmers, following the same pattern as IDA. It is also supporting the credit union movement—which on Cheju was started by Fr McGlinchey among his parishioners in 1962 — through improved credit union laws. 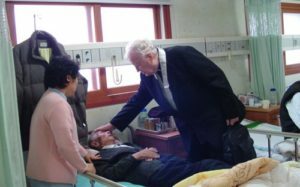 But in Jeju’s rush to modernise, through a network of new roads and a focus on the tourist industry, many of the islanders got left behind on their own and that is why Fr McGlinchey set up a nursing home on the island. Currently the facility caters for 75 residents and there is a long waiting list. In addition, there is also a hospice, which has no state funding, which can accommodate 29 people. Since 1972, Fr McGlinchey has become something of a national celebrity. On 5 June 1972 President Park Chung Hee bestowed on him the Order of Industrial Service Merit, Stone Tower, “in recognition of his contribution towards helping promote the nation’s livestock industry,” and asked him to address the Economic Planning Board to discuss Isidore projects. The government also made a half hour documentary television film of his work entitled, “The Sheep and Pig Farmer,” and ran it twice, nationwide, during the month of September. The money which accompanied the award (US$1,850) McGlinchey gave to the IDA clinic which the Columban Sisters had started in 1970. The clinic now treats some 17,000 persons annually.